What a weekend it was with all of our teams in action. The weekend got underway Saturday with the next generation of our club kicking off their season and many playing their first game of lacrosse. The under 11 boys Footscray Green team played Altona and put up a spirited effort, going down 8-11. Josh Mannix played a big role for his team scoring 6 goals for the day and was supported by Jagger Seafin playing his first game scoring 1 goal and 1 assist, piers mccoll scoring 1 goal 1 assist and Henry McGhee playing his first game having 2 assists. It was great to see so many first game players and we look forward to the team developing through out the year. The under 11 boys Footscray white team also played Altona at home. The team led for most of the day but ended up losing 8-9 with Altona outscoring them in the final qtr 4 goals to none. Jude Dale-Csarics was impressive in his first lacrosse game with 5 goals for the day and was supported by Elliot Duyvestyn who scored 1 goal, Zac Antin 1 assist and Gabe Bramich 2 goals. It was a great first effort from our two under 11 teams with many of the boys playing their first game so the future is bright at FLC. Under 13 boys Footscray White team played Melbourne Uni and won the game 12-2. The boys played really well and as a unit with many of the boys only starting this year its great to see how quickly they are coming together. Blake Gleeson was great all day in defence and is only playing his second game of lacrosse, his endeavour around the ground, ground balls, and reading of the play earned him a “Bulldog of the Week” award and a voucher to the Footscray/ Yarraville bowls club. Fred Brewer had 1 goal, Stanley Webb was also great on the day with 2 goals and 3 assists, Elijah Kukucka scored 2 goals and 3 assists in his second game for Footscray, Tom Olsen was also great with 2 goals, Harrison Lester ran all day for his team and was rewarded with 1 goal 2 assists, George Koupanis playing his first game of lacrosse had 1 assist along with Finley Banks playing his second game of lacrosse having two assists and Samuel Tonelli continued his great form from last year scoring 4 goals and 1 assist. Under 13 boys Footscray Green team played Altona, the team showed how spirted they are after being a little over whelmed by the size and physicality of the Altona side. The boys were down by three goals in the first qtr but their endeavour and skills came to the fore and they came away with the win 12-5. The midfield group ran all day with Jack Gerardi, Gus Crawford, Janitha Dharmabandu and Jake Mannix all spending time in the middle. The defensive unit of Eli Jess, Angus Fluker and Patrick Reinemann were all brilliant after qtr time playing great lockdown roles on their players. Jack Gerardi scored 2 goals, Jake Mannix had 2 goals and 3 assists, Will Laracy who is a first year player was great in attack scoring 3 goals, Angus Le another first year player was also great having 2 assists and some great saves in goals, Gus Crawford was a ground ball machine and ran all day never giving up which saw him get 2 assists, Valerio Cattoggio was clinical in front of goals with 4 goals, Janitha Dharmabandu was also great in the midfield running all day and ended up with 1 goal and 2 assists and Murphy Lockwood another first year player was superb collecting a number of important ground balls and 1 assists. All in all a great team effort and a great team win. Under 15 boys travelled out to Camberwell on Saturday and ended up playing short for the first half and then had a couple of injured players during the game, all in all they put up a great fight just going down to Camberwell 6-4. Broden “Brick Wall” Watson was great in goals making a number of important saves and helped his team be competitive all day. Sebastian Flanagan ran all day and was superb with 2 goals 1 assist, Liam Gillies ran long stick midfield all day and never gave up ending up with 1 goal 2 assists, Kyle Pearson had 1 assist and Orlando Cattogio had 1 goal. 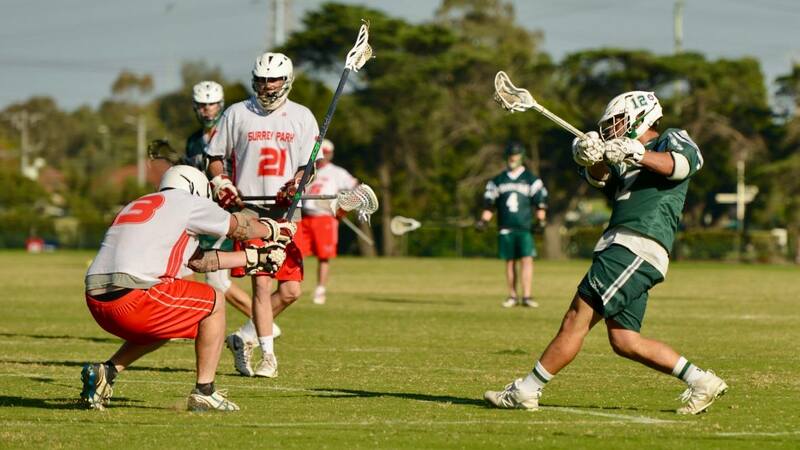 Under 17 boys got their season underway on Saturday and travelled out to take on Melbourne Uni, the boys played short all day but were still strong enough to come away with a win 9-5 which is an awesome effort. Kyle Chamberlain was great all day for his team scoring 7 goals, Jarrod Parsons scored 1 goal 2 assists and Jackson Marsh who gave his team first use out of the middle added 1 goal 3 assists. Congrats also to Alister Powell who played his first game this week and we hope you enjoyed it and continue on for a long time with FLC. Division 3 men played Melbourne Uni at home on Saturday and came away with a hard fought victory 12-7. Its great to see so many young kids, beginners and older players combining to have some fun and develop as a team. Steve Hecker was good all day scoring 3 goals and 1 assist, Jarrod Parsons was awesome with 3 goals and 3 assists, Kyle Chamberlain ran all day and was great at the x with 3 goals 1 assist, Richard Tonelli who helped out Melbourne Uni in the first qtr scored 3 goals when he donned the green and white for the last 3 quarters and Henry Murphy playing long pole had 1 assist. Division 1 men had a tough day going out to Chadstone and fought hard all day losing their game 19-2. The team is made up of a number of kids that are pushing to get into our state league side and was led by Callen Aherns making a number of saves. Lee Jones had a goal on the day with a nice outside shot and David Ryan had 1 assist while Xavier Fiorentini had 1 goal. Its great to see so many div 1 players at training each week and they continue to improve under coach Chris Marsh. Our State League mens team had their first home game on the weekend and it was great to see so many people at the ground supporting them. The game was a low scoring affair with both goal keepers making big saves and the defences of each team playing well. Our boys came away with the win 7-3 and grinded out the win all day. It was great to see how hard our team fought for loose balls and how our defence held Surrey Park to only three goals on the day. Jordan Germershausen had three goals on the day, Kane Mollison had 1 goal with a lefty snipe, James Lawerson had 1 goal, Matt Davies had 2 goals and Aaron ALdred had 1 assist. State League have a bye the week so at the break they are 2 wins and 1 loss and its good to see them building into the year. It was great to see our under 11’s girls playing games on Sunday again and thanks to Di Prentice for the hard work that she has put in to get this up and running. The under 11 green team played Williamstown Women Gold and came away with a victory 11-5. Lily Walsh had 3 goals and 4 assists, Stella Olsen had 4 goals, Zoe Olsen had 1 goal while R Gemmel had 1 goal 2 assists, A Mason had 1 goal and N Danm-South had 1 goal. The under 11 white team also played Williamstown Women Blue and came away with an opening round victory 5-1, with a lot of new players this was an impressive opening round with V Kitanovski scoring 2 goals and 1 assist, L Ivelja scoring 1 goal, A Gilmartin 1 assist, R Gaden 1 Goal, while Mia Tonelli playing her first game had 1 assist along with E Liew who had 1 goal. Like our boys sides we are the only club in Victoria to have two under 13 girls teams which is a massive achievement. The Footscray Green team played Williamstown Women and had a one sided victory winning 17-0. Zoe Hibbard had 4 goals, Abbie Yu had 3 goals and 1 assist, Tara Gilmartin had 3 goals and 1 assist, Greta Murphy had 3 goals and 2 assists, Ebony Norman had 2 goals and 3 assists, Grace Gilmartin had 1 goal 1 assist, Sommer Habib had 1 goal, Mabel Murphy had 1 goal while Georgie Giles had a massive day in the cage keeping a shutout. The Footscray White side played a strong Newport outfit going down 18-2 but the girls tried hard all day. Stella Olsen had 1 goal and Angelica Schroeders had 1 goal while Niamh Damn-South had 1 assist and so did Vanessa Kitanovski. All in all it was a good day for our under 13 girls with a lot of new faces to the sport the future looks bright at FLC. The Footscray Under 15 girls side played Williamstown Women on Sunday and it was a close game all day with our girls just going down at the final bell by a score of 16-12. Lucinda Brewer had 4 goals for the day, and was assisted by Tara Gilmartin scoring 2 goals and dishing off 2 assists. Ebony Norman had 1 goal, Marlee Kukucka had 1 goal, Lily Gerardi had 1 goal, Yvette Hoang had 1 goal, Mihiri Dharmabandu had 1 goal 1 assist and Petra Hansby had 1 goal 1 assist. Our under 17 girls side played a combined Eastside team and were stellar all day wining the game 23-4. The big names that played in the under 17 tournament came to the fore with Bonnie Yu scoring 7 goals 2 assists, Nikala Patsolaridis scoring 7 goals 2 assists and Georgie Latch scoring 6 goals 3 assists. Alanah Hibberd had a great game scoring 2 goals, while Isabella Murphy 1 goal and 2 assists and Eliza Green had 1 assist for the day. It was a solid four qtr performance by the girls and we look forward to see how they go this season. Our Division 1 women played a determined Newport side on Sunday and it was great to see so many new parents taking up the sport and showing their kids how its done. The final score was 17-5 and with so many new players and kids stepping up to play seniors we are sure this team will get better as the year progresses. Lucinda Brewer had 3 goals, Georgia Tucker had 1 goal, Alexandra Davies had 1 goal, Sam Ahmed had 1 assist. Keep up the good work team and the results will come. The newly formed premier division kicked off this weekend also with Footscray having two sides in the division. Footscray Green had a bye while our Footscray side played off in their grand final rematch where the old foe Newport turned the tables from last years grand final and came away winners 13-8. The game was close all day and under new coach Glen Mollison we are sure that the sky is the limit for this team. Goal scorers on the day were Danelle Mollison had 4 goals, Sarah Mollison had 2 goals and 1 assist, Stella Justice- Allen had 1 goal, Sarah Smith last years grand final MVP had 1 goal and 1 assist, while Abbie Burgess had 1 assist as did Bonnie Yu. All in all a great round of lacrosse for FLC be sure to get down to the club each Saturday night for 6 o’clock rock where we read out the rounds results go through best players and award our “Junior bulldogs of the week awards”. This weeks winners were Lily Gerardi taking home the $25 Spotswood Hotel award for being a team player and always looking out for her team mates, the following “Bulldogs of the week” have won a $15 voucher to the Footscray Bowls Club Johnston Plummer for jumping in the goals and doing a great job when his team needed him, Blake Gleeson a first year under 13 player for reading the play, getting groundballs and running with the ball, Georgia Latch for her sharp shooting and last but not least Sommer Habib excellent dodging and running up and down the field all day.